This is the Shanholtzer home. The original Shanholtzer place was just east of Bronaugh (now across from the school.) We do not have identifications of the people in this photo but is is clearly marked Shanholtzer. Dr. Julie Combs is sure that this is not the Shanholtzer place across from the school. Her family later owned it and she lived there. So we need to know where this house was. However, there is proof that this one was at Bronaugh. 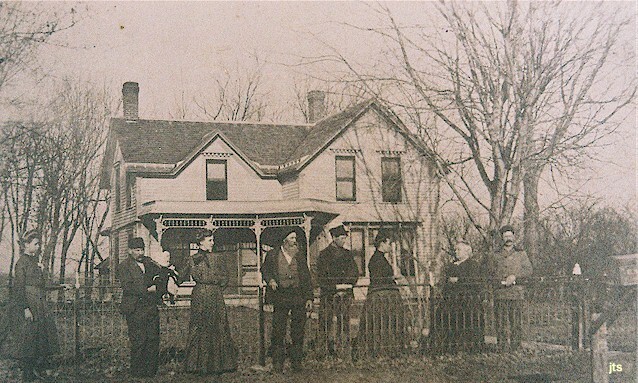 This is an undated photo that shows Vernon County residents who had all lived in the county for fifty years or more. The lady in the white dress holding the umbrella is believed to be Mrs. Shanholtzer (same lady in top photo). 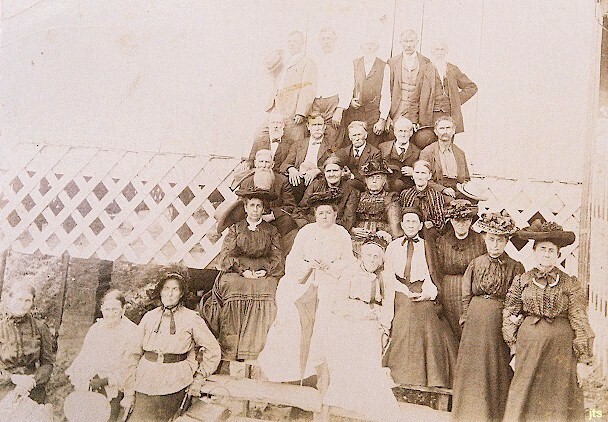 The only other identified folks in this scan are Dr. Albert Badger, back row right with beard and Mrs. Emily Hurley, old lady in white seated center. 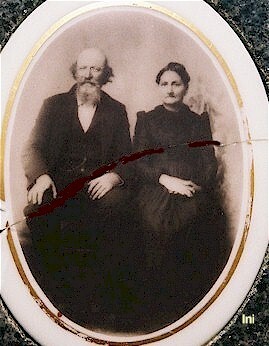 Mr. and Mrs. Bushrod Higgins Shanholtzer apparently came to Vernon County by 1871 because an infant of theirs was buried at Moundville Cemetery that year. 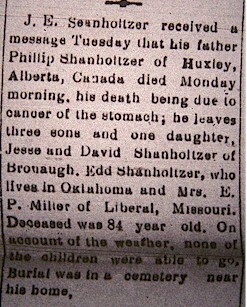 George Lee Shanholtzer, son of Bushrod and Rachel. Feb 3, 1870 - Aug. 23, 1871. Ross, son o f J. L. and M. - May 20, 1856 - September 1, 1881. From History of Vernon County, Missouri. 1887, p. 806. (Farmer and Stock-raiser, Section 20, Post-office, Bronaugh). The subject of this sketch furnishes a good illustration of what can be done by any one in Vernon County who starts out to succeed, and with a determination to overcome the many obstacles that are sure to beset his pathway through life. Mr. Shanholtzer was born in Hampshire county, W. Va., October 3, 1847, and is the son of Peter Shanholtzer, also a Virginian by birth, and at the present time a resident of this county, and a farmer by calling and occupation; his wife, formerly Miss Mary J. Williams, of the same State as himself, bore a large family of children, four of whom are now living. Phil. was the second child and eldest son. His life up to 1869 was spent mostly in Tazewell, Knox and Macon counties, Ill., to which locality he had removed from the Old Dominion, and during this time his attention was devoted almost exclusively to agricultural pursuits. In 1869 he came to Vernon County, Mo., and purchased 6 acres of landthe foundation of what was destined to be a large and valuable farm. Setting out an orchard on this small tract he went to work with a will, but soon disposed of this first purchase and bought 40 acres, to which additions have from time to time been made until at the present time he is the owner of 5811/2 acres, 240 acres of which adjoin the town limits of Bronaugh. No man since coming to Vernon County has achieved a more enviable record for thorough-going, energetic business principles in farming operations than he, and neither has any one been more successful. As a cattle feeder and raiser he has become well known, and while there may be some equally as prominent in this direction there are none who will excel him. Indeed, in the present day we are apt to consider such success as has followed Mr. Shanholtzer almost phenomenal, and yet in this instance we find that these results have been brought about largely by a straightforward, practical and industrious course, and in a way that commands the approval of all. Personally he is held in high esteem, as is also his wife, Miss Sarah Cohenour, whom he married in 1870. She was born in Illinois. Mr. and Mrs. S. have three children: David M., Edward P. and Jesse. Mr. Shanholtzer is a member of the A. F. and A. M.
Here are some miscellaneous Shanholtzer notes from Joane. The grave marker to the left is for Mary J. Shanholtzer, wife of Peter Shanholtzer, who died in 1899. Welborn Cemetery, Moundville. Grave marker to the right is for Horatio A. Shanholtzer who died in 1884 at the age of 21. There is a William Shanholtzer (1852 - 1935) in Worsley Cemetery with wife, Margaret. If you have corrections, additions or other information on this family, please email us.